Commissioned for Pope Pius IV (Giovanni Angelo Medici, 1495–1565) in 1561. Collection of Marchese Fabrizio Paolucci di Calboli, Forli. Seventeen red seals on the vertical stretcher members have all been crushed and flattened. Rollin van N. Hadley (ed.). The Letters of Bernard Berenson and Isabella Stewart Gardner 1887-1924 (Boston, 1987), pp. 48-49, 51-62, 82-83, 86-87, 90-91, 93, 103, 118, 129-30, 147. Mina Gregori et. al. Sofonisba Anguissola e le sue sorelle. Exh. cat (Cremona: Centro culturale, 1994), pp. 33, 36-38, 45, 98, 128, 130-131, 135, 137, 141, 145, 151, 246, tav. 4. 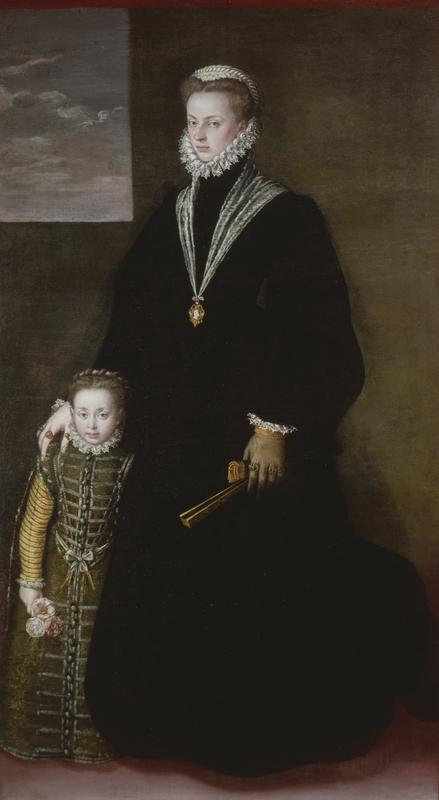 Sylvia Ferino-Pagden and Maria Kusche, Sofonisba Anguissola. A Renaissance Woman (Washington: National Museum of Women in the Arts, 1995), frontispiece, p. 66. Hilliard Goldfarb et al. Italian Paintings and Drawings Before 1800 in the Isabella Stewart Gardner Museum. Unpublished manuscript. (Boston, 1996-2000). Fernando Checa Cremades. Filepe II: Un Príncipe del Renacimento. Exh. cat. (Madrid: Museo Nacional del Prado, 1998), p. 361, no. 64. Alan Chong et al. (eds.) Eye of the Beholder: Masterpieces from the Isabella Stewart Gardner Museum (Boston, 2003), pp. 90-91. Helen H. Reed and Trevor J. Dadson. La princesa de Éboli Cautiva del rey: Vida de Ana de Mendoza y de la Cerda 1540-1592 (Madrid, 2015), pp. 161, 164. Isabella Stewart Gardner bought this painting as a Titian, although she had been warned by Bernard Berenson that the attribution was in some doubt. Perhaps reluctant to disappoint his patron, Berenson changed his mind, and helped Gardner with the purchase. She hung the painting opposite Titian’s Europa. Although not by Titian, it was painted at precisely the same time that the Europa arrived at the Spanish court. Sofonisba Anguissola was born into a minor aristocratic family in Cremona, and studied painting under Bernardino Campi. In 1560, she was appointed painter to the new queen of Spain, Isabel de Valois (1546–1568), who had become Philip II’s third wife. She taught the young queen drawing and made numerous portraits of the royal family and members of the court. The subject of the portrait, Juana of Austria (1535–1573), was a formidable politician and patron of the arts. Daughter of Charles V (she wears a cameo of the emperor in this painting), Juana married Prince Juan of Portugal. After just two years of marriage, Juan died and Juana returned to Spain to become regent while her brother Philip II was in England. Although she was celebrated for her ability in state affairs, Juana thereafter devoted her energies to religious life. In 1557, she founded a monastery, the Descalzas Reales, which became an important center of artistic patronage. This portrait was painted in 1561 for the pope, and was thus meant to show Juana’s religious devotion. The child by her side is probably a young aristocrat under her protection who is being prepared to enter the religious order. Source: Alan Chong, "Portrait of Juana of Austria with a Young Girl," in Eye of the Beholder, edited by Alan Chong et al. (Boston: ISGM and Beacon Press, 2003): 91.